An abundance of luxurious golf resorts await in Turkey, with world-class golf onsite. 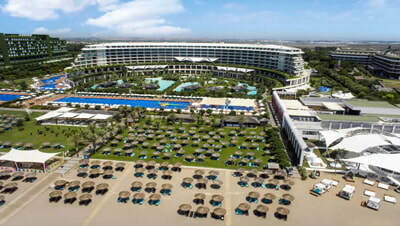 Take Sueno Hotels Deluxe Belek for example, a spectacular 5-star resort with 2 excellent courses on offer. Another hugely popular option is the Regnum Carya Golf & Spa Resort, situated on the picture-postcard coastline in the heart of Belek. The onsite Carya Golf Club, host of the 2017 Turkish Airlines Open, is widely regarded as one of the best courses on the continent. ​Turkey golf holidays were once a well-kept secret, but this beautiful country is now one of the most popular golfing destinations in Europe thanks to its combination of magnificent championship golf courses and luxury 5* all-inclusive resorts. Head to Belek, in the south, where spectacular resorts await including Suenos Hotels Deluxe Belek, Gloria Serenity Resort and Gloria Serenity Resort. 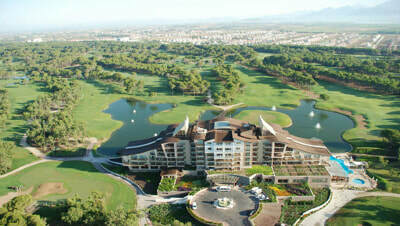 Golf in Turkey has now become synonymous with championship golf courses and luxury hotels. Gloria Golf Resort, set at the foot of the magnificent Taurus Mountains, is one of the most popular resorts available, catering for golfers and non-golfers alike with a superb range of facilities. If you’re searching for an all inclusive golf holiday in Turkey, look no further. Another spectacular golf resort is Sueno Hotels Deluxe Resort… again hugely popular with our clients.